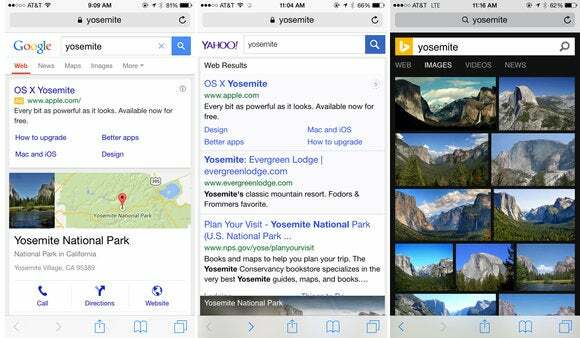 Which search engine should be crowned king of Mobile Safari? In the search engine game, it’s all about eyeballs. 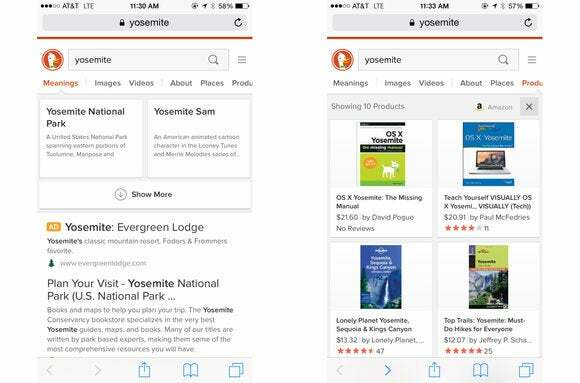 Google, Yahoo, and Microsoft rake in billions each year from search ads, and now those companies are competing to be the default search engine in Mobile Safari on your iPhone and iPad. It's easy to change Safari's default search engine. Until now it’s always been Google, but according to a report in The Information (subscription required), that deal expires in 2015. Its sources say Apple’s Eddy Cue has entertained pitches from both Yahoo and Microsoft, maker of Bing. Currently, Bing actually powers Yahoo’s search in return for a cut of its ad revenue, although Yahoo and Bing do compete to get your eyeballs in the first place. 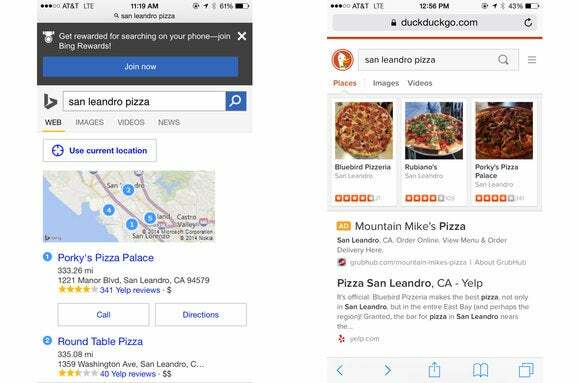 Bing is used by both Siri on iOS and Spotlight on your Mac. Being the default search engine for millions of iOS devices is a big deal. 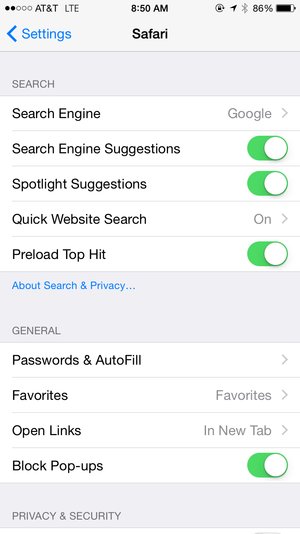 Most people probably don't bother changing the default, but it is possible: Open up Settings > Safari, and the very first option is Search Engine. 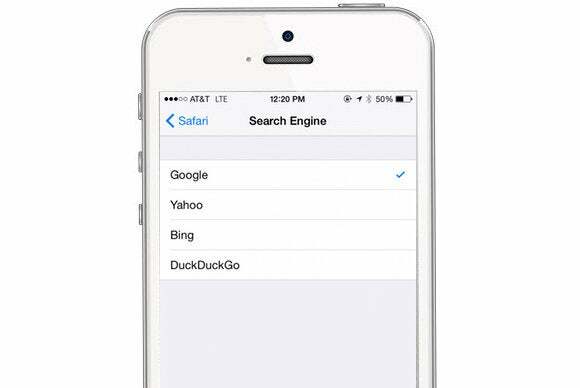 Tap that to switch from Google, the default, to either Yahoo, Bing, or privacy-friendly DuckDuckGo (a new option in iOS 8). You’re still able to navigate to any search engine, of course. The default search engine is what Safari will use when you type your search query directly into the Search/URL bar at the top. To get a sense of how different those search engines actually are, I ran three searches with each. I searched the term “Yosemite,” as well as “San Leandro pizza” for some local interest, and of course “Taylor Swift,” because who can get enough? Yosemite: Google returned an ad for Apple’s latest OS as the first result, followed by a Maps result for Yosemite National Park. The next three results were also for the park: Its home page, its Wikipedia entry, and the official guide to lodging and activities. Apple’s Yosemite page is next, followed by news results, images, and “in-depth articles” from sources like National Geographic, Outside, and Ars Technica. Pretty comprehensive, and definitely well organized—I especially like how all of these sections can be expanded for more results. Bing did a better job of labeling Apple’s Yosemite ad, along with an ad for the actual park. Tabs across the top of the page let you jump from Web to Images, Videos, and News, which is a nice touch. The results were mostly the same as Yahoo’s (which isn’t surprising), but I thought Bing organized them a little better. DuckDuckGo has a neat tabbed design for search results, and I give it bonus points for being the only search engine to recognize the existence of Yosemite Sam. The ads are clearly marked, and I even like the use of favicons next to each URL. The main list of results was just websites (Apple’s Yosemite OS was way down the list, an embarassing 25th, after two results for Yosemite the obscure 2014 movie. Weird. But the tabs let you easily jump to Images, Videos, About, Places, and even Products, which returned a grid of results from Amazon. San Leandro pizza: I ran these searches near my house in San Leandro, CA (it’s the new Oakland! OK, not really), so I thought this search might be illuminating on how well the different search engines could find local results. Google did great, telling me where the pizza places were, when they opened, often how much I’d expect to spend (in a basic $ to $$$$ way, not with actual numbers), and a rating based on user reviews. I liked how it presented results three at a time—just enough to fill one screen—and then let me swipe through horizontally to see more. 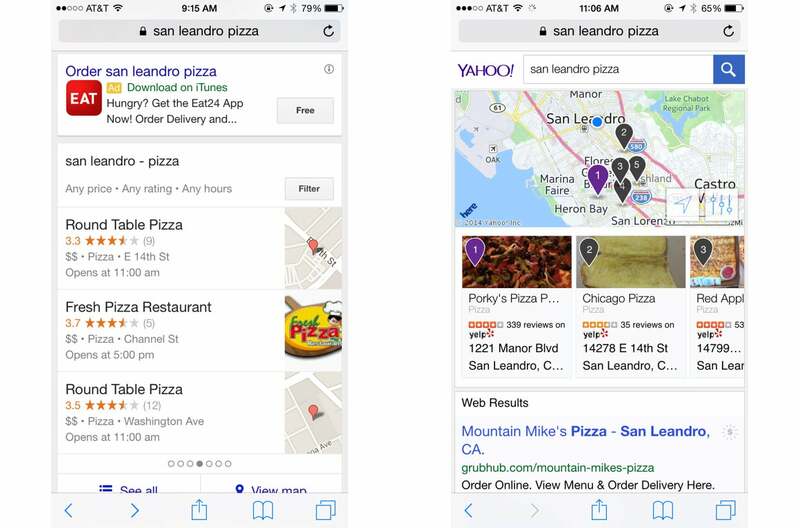 I like how Google told me when the pizza places were open, but Yahoo's interactive map is a lot better (and there's a filter option for "open now" too). Searching Yahoo gave me a map of the results right up top, with a horizontally scrolling list of pizza joints, with addresses and Yelp scores. I love how as I scroll through the list, the map updates, highlighting the one I’m looking at. The opening times aren’t listed, but you can filter the results by Best Match, Highest Rated, Distance, and price—and flip the “Open now” switch to show only places ready and waiting to feed you. The next results were ads and Yelp pages. Bing’s results were topped with ads, then a map of results—the map isn’t as attractive as Yahoo’s, though, and I couldn’t find any filtering options to sort the results by price, distance, or rating, which both Google and Yahoo provided. A banner along the top cajoled me to join Bing Rewards, which incentivizes you to stay signed into your Microsoft account when you search Bing. You’ll earn credits toward gift cards for places like Starbucks, Burger King, and Amazon, or you can donate them to charity. Bing's map is pretty ugly, and DuckDuckGo doesn't bother with a map but did find my two favorites right away, probably because they rank the best on Yelp. DuckDuckGo defaulted to the Places tab, and offered horizontally scrolling Yelp reviews, sorted by rating—which surfaced my two favorite pizza places immediately. But if you want a map of locations, you’re out of luck. The Images and Videos tabs didn’t return much of interest—who searches for pizza just to look at pictures of pizza? People on diets, maybe? 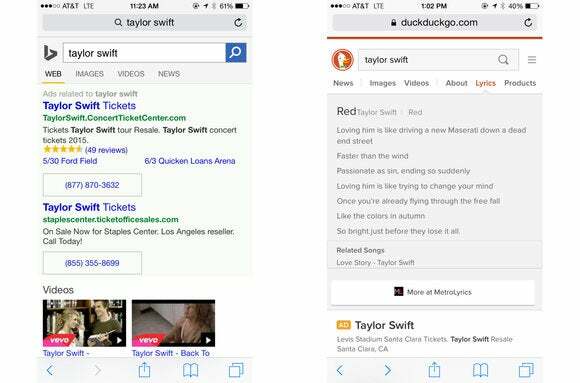 Taylor Swift: Searching Google for Ms. Swift first brought up news, then her home page, images, and then Listen Now ads for Rhapsody, Google Play, and iTunes. I could also jump to her various social media profiles, or tap one of her album covers to search for more info about that album. Regular results and in-depth articles came later. Google found more recent Taylor Swift news than Yahoo. 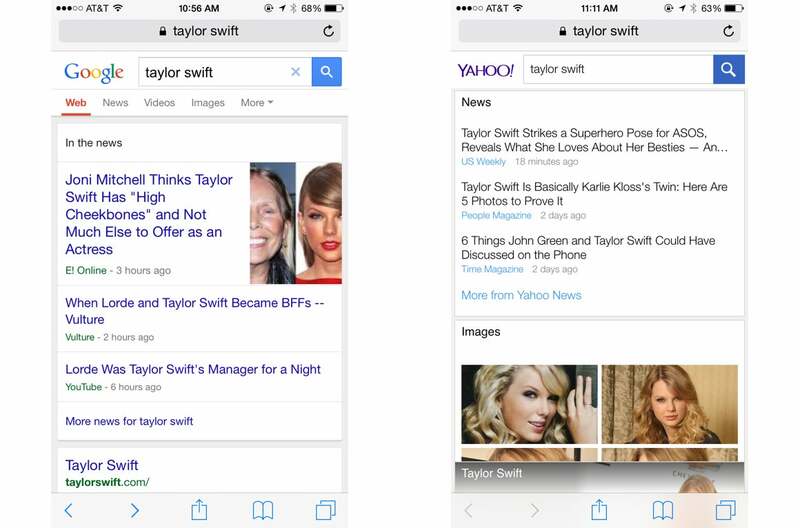 Yahoo served up Taylor Swift news, then images, Wikipedia, web results, and more YouTube videos. Nothing about her albums or links to stream them on various services. Tapping “More Videos” returned more than a dozen of her music videos on YouTube, which is almost better than a link to a streaming service, since YouTube is free. Bing led the search results with two giant ads that took up more than half of the screen, followed by videos on Vevo, then news, then regular web results, with images and the Wikipedia entry kind of sprinkled in—you’ll see a couple of websites, then images, then a couple more websites, then Wikipedia, then more websites. It’s kind of a mess, but again, the tabs along the top of the page let you jump to Images, Videos, and News, filtering out the rest of the cruft. Bing's ads were too big, and results were pretty jumbled until I filtered them with the tabs. DuckDuckGo's Lyrics tab has potential, but was ultimately disappointing. I was initially intrigued about the Lyrics tab on DuckDuckGo’s results for Taylor Swift, but it just picked her song “Red” seemingly at random, and only the first verse was shown, with a link to MetroLyrics to get the rest. The Videos tab is great, though, with results from Vevo and YouTube, along with the view counts for each so you can easily tell the viral hits from the, uh, deeper cuts. I’m sticking with Google mostly out of habit, but this experiment has made me wish I didn’t need a default, since the search engines each have their own strengths and weaknesses based on what you’re searching for. Instead, I’d like to be able to enter a term and then choose on the fly which search engine to use: DuckDuckGo if I’m shopping (or want to stay private), Google if I’m after images, Yahoo for local business, and so on. What search engine do you use in Mobile Safari? If Apple changes the default away from Google next year, will you just go in and change it right back? Holler at me (not literally) in the comments.